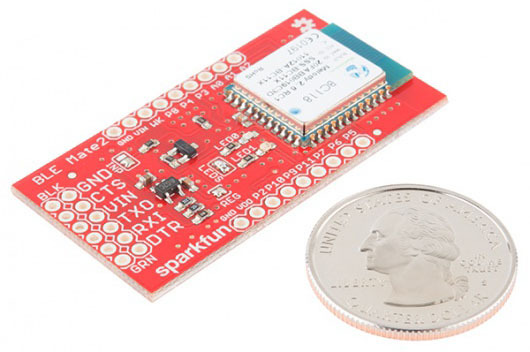 SparkFun's Bluetooth low energy (BLE) Mate 2 is a no-nonsense Bluetooth 4.0 (aka Bluetooth low energy or Bluetooth Smart) development board related to our Bluetooth Mate Silver and Bluetooth Mate Gold. The BLE Mate 2 only supports Bluetooth 4.0; it won't connect to older devices. It's also worth noting that BLE does not support a Serial Port Protocol as older versions of Bluetooth did; that makes interoperability between BLE dongles, devices, and modules harder than with Bluetooth Classic. As you can see, the BLE Mate 2 is a small board: 1.0" by 1.95" (25mm x 50mm). 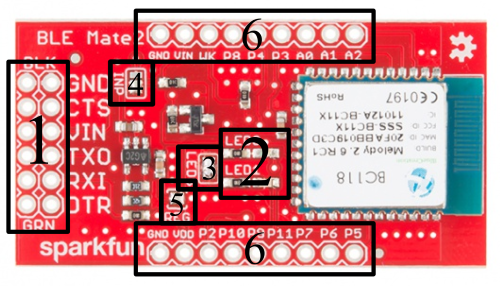 The six-pin header on the end opposite the module is a "host" serial pinout, the same as that on the FTDI Basic boards, which allows the BLE Mate 2 to be connected directly to any device with a matching header, such as the SparkFun Arduino Pro and Pro Mini. Coupled with the FTDI SmartBasic, you can even develop your code without having to swap cables! The board has built-in level translation, so it can be used with boards of higher voltage than the 3.3V default used by the BC118. You'll also notice that there are breakout holes available for all the pins on the BC118 module; we'll cover the use of those in a later section. Arduino Pro 5V - You could just as easily use the 3.3V version, or the Pro Mini, or (in fact) any board that supports serial communications. BLE Mate 2 (natch) - Depending on what you want to do, you may need two of these. We'll demonstrate an example connecting to another BLE Mate 2 as well as providing some application examples showing how to connect to an iPhone or an Android device. 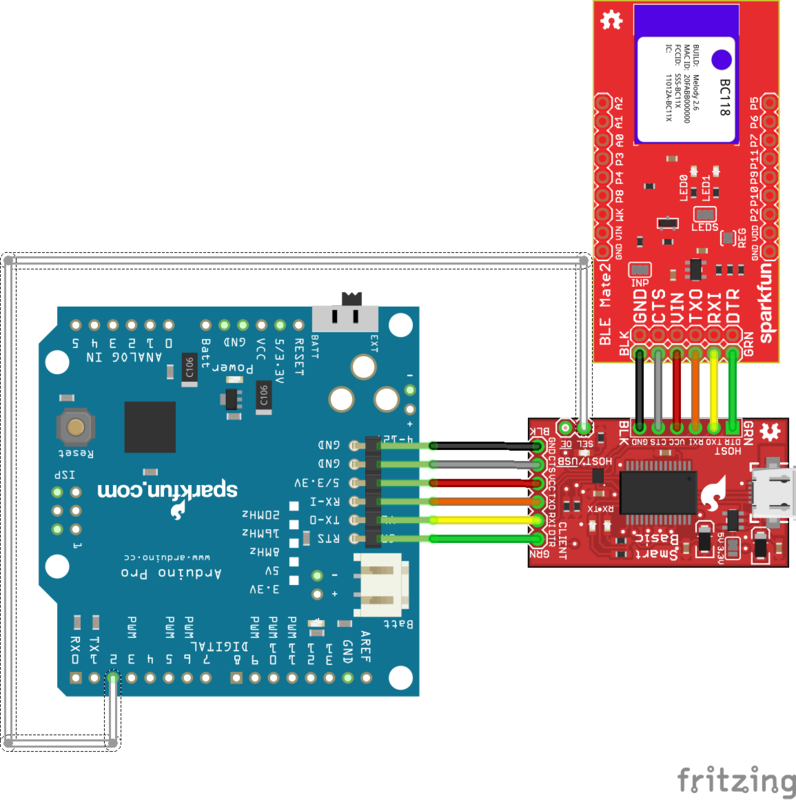 FTDI SmartBasic - The SmartBasic was designed for just this application--to allow an Arduino to be programmed while allowing the hardware serial port to be selectively attached to another serial device. It's not recommended that you use a software-controlled serial port for this application as the data flow from the BLE Mate 2 can easily overwhelm the buffer. Snappable male header pins - You'll need to add pins to the SmartBasic and the BLE Mate 2 (if you want to plug the BLE Mate 2 into a breadboard). 6- and 8-pin female headers - at a minimum. You'll want a 6-pin female for the BLE Mate and the SmartBasic and an 8-pin for the Pro. Jumper wires - You really only need one of these, to connect the Arduino Pro to the OE line on the SmartBasic. Loading an Arduino Library - There is a library available for the BC118 module on the BLE Mate 2 github repository, and this tutorial will explain how to load it. Hexadecimal - A lot of the parameters used by the BC118 are in hexadecimal; brush up on what that means with this tutorial! Bluetooth Basics - Learn some of the basics of how Bluetooth works. 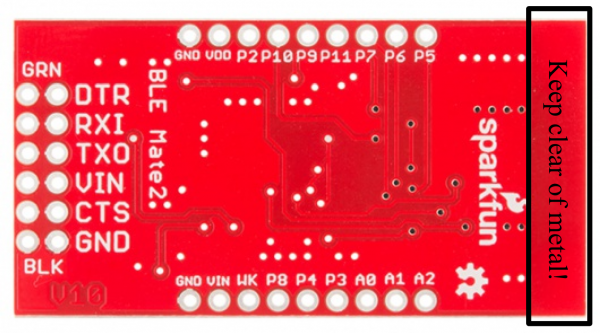 Let's take a look at the BLE Mate 2 board. The image above has the major parts of the BLE Mate 2 labeled. We'll start with the front, since it's more interesting. We're just going to apply labels to things here; we'll discuss their full use on the next page. 6-pin FTDI Basic compatible serial header - This header has the same pinout as that of an FTDI Basic board; it's meant to connect to a client device such as an Arduino Pro. If you want to connect it to an FTDI Basic board, you'll need to either make or buy a crossover adapter. We've provide two rows of pins to make multiple connections to these pins (e.g. to sniff the signals for troubleshooting) easier. 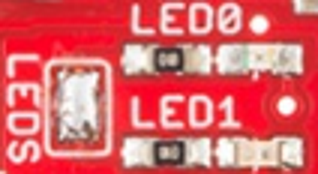 LED0 and LED1 - These LEDs display information about the current state of the module. These LEDs reflect the logical state of the module, and a reset of the module may be needed before the settings take effect. More on that later. LEDs jumper - this jumper ships closed with solder; clear the jumper to disable the LEDs and save some current for low-power situations. INP jumper - this jumper connects the voltage input pin on the 6-pin header to the 3.3V regulator on the BLE Mate 2. It can be cleared to remove the regulator from the circuit and save current. REG jumper - clearing this jumper will break the connection between the output of the 3.3V regulator and the supply of the BC118 module. GPIO headers - All the pins on the BC118 are broken out to these pins, as are power and ground. The back is much simpler. You'll note that all the pin labels are present on this side as well. The one thing that is really worth pointing out from this side is the keepout at the top of the board. You can see that the ground plane only extends so far up the PCB; for best performance, you should try and keep that area free of any metal when embedding the BLE Mate 2 in a project. Failing to do so may result in interference or a loss of signal strength. This page will cover both general hardware connection for the BLE Mate 2 as well as specific information for this tutorial. The pinout on this header matches that of the FTDI Basic boards, so it can be used anywhere an FTDI basic can be. However, it's probably not fast enough to do any kind of wireless bootloading. DTR - Connected only to the other DTR pad. This pin can be connected to PIO5 to provide a DTR output to the client device; that signal will be at a voltage determined by the supply voltage of the BC118 module and so may not be adequate to drive the reset signal on an Arduino. RXI - Data IN from the client device. TDO - Data OUT from the BC118 device. Shifted up to the level on the VCC pin of this header. VCC - Connected to the INP jumper (see below). CTS - Connected only to the other CTS pad. Can be connected to PIO6 to provide an RTS signal to the BC118. That signal must not exceed the supply voltage of the BC118 module. GND - Negative supply rail for the entire module. The currently useful pins on the BC118 module are all broken out to these headers; I'll go over what they do and what they can do. Here, I'll talk about commands and configuration parameters on the next page, but they will be referenced below. **AIO2 **- By default, this is an analog input, which can be read by sending the command "AIO 2" to the module. The module will respond with the voltage on this pin, in mV. If the "ACFG" parameter is "ON", this pin will reflect the module's state: HIGH if the module is connected or LOW if the module is not. AIO1 - Default function is same as AIO2. If the "ACFG" parameter is "ON", pulling this pin HIGH will enable transparent mode, causing data presented to the RX pin to be sent verbatim to any connected device. AIO0 - Default function is same as AIO2. If "ACFG" is "ON", this pin determines the module's role at boot time. If the signal is HIGH, the module will boot into Central mode. If LOW, Peripheral mode. P3 - GPIO3. Default is to either mirror from or mirror to another connected device. More on this later. P8 - By default, exit transparent mode. Can be configured as an IO pin for mirroring by setting the "GPIO" parameter to "OFF"
WK - Dependent upon the "WAKE" and "WLVL" parameters, this pin can be used to wake the device from hibernation. VIN - This pin connects to the INP jumper. More on this below. GND - Ground for the entire circuit. P5 - When parameter "FCTR" is "ON", this will be a CTS output from the BC118. P6 - When parameter "FCTR" is "ON", this will be an RTS input to the BC118. P7 - GPIO7. See P3 above. P11 - GPIO11. See P3 above. P10 - GPIO10. See P3 above. P2 - Not currently enabled. VDD - This pin ties directly to the supply rail of the BC118. It must be kept between 1.8V and 4.3V to avoid damage to the module. As mentioned on the previous page, LEDs 0 and 1 provide some easily accessible feedback on the current state of the module. Here's a decoder ring for sorting out what they mean. Note: the LEDs will change to represent the current settings of the module when changing into scanning, advertising, or idle modes, but the module will not change state until the changes have been written to non-volatile memory and the module has been rebooted. This jumper disconnects the cathode side of the LEDs from the ground plane, disabling them and eliminating the few hundred microamps each one draws under normal circumstances. It ships closed by default. The INP jumper, pictured above, has four possible configurations but only three valid ones. This is the default mode, as it ships. In this mode, the input voltage from the VCC pin on the 6-pin header and the VIN pin on the GPIO header is routed to the 3.3V regulator. In this mode, the input side of the regulator is disconnected from all pins, and the module's supply is connected directly to the VIN pin and the VCC pin. In this situation, the voltage present on the input must be between 1.8V and 4.3V. That's within the range of a single-cell LiPo battery, but not of a 5V target board! It's probably a good idea to clear the REG jumper at this point, too; putting a voltage on the output of the regulator but not on the input is liable to cause odd behavior. The level shifting circuit is still active here, so if the data lines on your processor are at a higher voltage than the BC118 is being fed, communications will still work. With no solder on the jumper, you've completely disconnected the module from the VCC and VIN pins entirely. You'll need to provide power to the 3.3V pin on the GPIO header directly, with the same caveat as earlier regarding the voltage range. Again, you should clear the REG jumper. Finally, the fourth mode, which I'm not only going to include a picture of, it's so inappropriate: a big old solder glob covering all three pads. Don't do this. Seriously. It probably won't do anything bad, but it's not going to help your current consumption any, it may damage the regulator, and it will bypass the regulator. Just don't do it. While you can just skip over this page and go straight to the code example and library documentation, it's probably a good idea to at least skim it so you have some idea what's going on under the hood. The BC118 realizes a custom BLE profile, so you'll have to take that into account when developing an app for it. It also means you won't be able to easily connect it to any other BLE modules other than another BC118. Generally, when you change settings on the BC118, you need to write the settings to the onboard non-volatile memory and reset the module before they will take effect. When in doubt, write/reset--it's the only way to be sure. When the module boots in Central mode, it will immediately begin scanning and will scan until it reaches the timeout period (which may be never). To connect to a Peripheral devices, the BC118 must be in Central mode, and scanning. This makes programmatically detecting a successful connection difficult, as the acknowledgment of the connection is buried in a stream of detected devices. The BLE Mate 2 library takes care of that for you. From the factory, the BC118 comes programmed to accept and transmit via the UART at 9600bps. There are two types of transactions the user can initiate with the module: Commands and setting/getting parameters. The BC118 expects a carriage return ('\r') at the end of a command string; if you send a newline ('\n')(which is frequently a standard practice in serial communications; the Arduino println() function sends "\n\r" at the end of the transmission), that will cause a receive error. All responses from the BC118 will be ended with "\n\r", however, which makes that a good string pattern to recognize for detecting responses from the module. If the module was unable to parse the string between the last two carriage returns into a command, it will respond with "ERR\n\r". At that point, the buffer is clear, and that fact can be a useful way to get to a known state for re-synchronizing user code with the buffer in the BC118. Finally, regarding "transparent" mode: it's possible to put the module into transparent mode, where it forwards data presented on the UART directly to the remote device, and forwards data received from the remote device directly to the UART. Unfortunately, once transparent mode has been activated, there's no escape sequence that can be sent across the UART to return to data mode. GPIO8 and AIO1 can be used to exit transparent mode, but only if that function has been enabled (by setting the parameters GPIO and ACFG to ON, respectively). If those parameters haven't been set, and transparent mode is entered, the only way out is to power cycle the module. Here's a list of useful commands. For more information, you can refer to the Melody Smart User Manual on the BlueCreation website. Commands will be presented with the command first, then parameters to be passed afterwards in parentheses after the command, but the parentheses are not part of the command. Optional parameters will be in brackets. A pipe ('|') will be used to separate "choose one of these" parameters. ADV (ON|OFF) - Turn advertising on or off. While this can be toggled without error in Central mode, it will have no effect. AIO (0|1|2) - Report the analog voltage, in mV, on the respective analog input pin. CON [(BT ADDRESS) (TYPE)] **- **Device must be in scan mode for this command to work! If parameter ACON is '1', no parameter needs to be passed to this command and the module will connect to the first target that supports the Melody Smart protocol (i.e., another BC118 or an app you've written on a target device). Otherwise, BT ADDRESS should be the full 12-character hex address of the device to connect to, and type should be 0 for a public address (most common) or 1 for a private address. DCN - Disconnect from remote device. Works in either peripheral or central mode. HIB (timeout) - The "timeout" parameter should be an integer value between 1050 and 429496795, and represents the number of 1.024ms periods to elapse before the device emerges from hibernation. Restarting from hibernation is a clean reboot to stored settings. GET (parameter) - Returns the value of (parameter), which can be any of the configuration parameters listed below. RST - Resets the chip, loading all settings from non-volatile memory. RTR - Restores all settings to factory defaults. SCN (ON|OFF) - Enable or disable scanning. SET (parameter)=(value) - No spaces around the equal sign! Set (parameter) to (value). Settings changed in this way will not persist through a reset or power cycle unless the WRT command is issued (see below). SND (data) - Send a stream of binary data. At most, 20 characters can be sent when in Central mode and 125 in Peripheral mode, and the data must not contain a newline ('\r' or 0x0D) as that will trigger transmission. STS - Return the status of the module. VER - Return the version of Melody Smart on the current module, and the module's 12-character Bluetooth address. WRT - Save the current settings to non-volatile memory, causing them to persist after a reset or power cycle. Note that many settings require a WRT/RST cycle to actually take effect! In addition to the commands listed above, there are some parameters governing the behavior of the module which can be set or checked via the SET and GET commands mentioned above. Here are some of the most important ones. ACFG=(ON|OFF) - When OFF, AIO pins are available as analog inputs. When ON, they can be used for control and reporting (see the "Hardware Connection" page for details). ACON=(ON|OFF) - When ON, the module will connect to the first discovered compatible device. This may not be the device you want to connect to! ADVC=(ON|OFF) - When ON, the device advertises constantly if not connected. ADVP=(SLOW|FAST) - Advertising rate. Using SLOW will consume less power but make connecting to the module slower. ADVT=(timeout) - How long the device will advertise after advertising begins (either at boot or due to the ADV command). Values range from 0 (forever) to 4260, and are integer representations of seconds. CENT=(ON|OFF) - Enable or disable Central mode. Must WRT/RST to make this take effect! CCON=(ON|OFF) - Should the device scan/advertise upon disconnection? CONP=(max_conn_int) (min_conn_int) (latency) (timeout) - Settings this device will send to a Central connecting to it. (max_conn_int) must be greater than (min_conn_int), and both must be between 6 and 3200 and represent the connection interval in units of 1.25ms each. They represent the longest and shortest intervals between which the Central device will ask for data. (latency) is in terms of connection intervals and represents the connection slave latency, which is the number of periods the Peripheral will ignore the Central if it has no new data. Finally (timeout) is the connection supervision timeout, the longest period the Central device should wait before declaring the link lost. It's an integer, in units of 10ms. If you haven't done so yet, download the .zip file of the BLE Mate 2 GitHub repository and install the Arduino library from the "Arduino/libraries" sub directory. I've reproduced the code in its entirety below. BLE Mate 2 board by SparkFun electronics. //  shallow buffer of the SoftwareSerial object. //  example with this code. //  functions called "selectBLE()" and "selectPC()"
Serial.begin(9600);    // This is the BC118 default baud rate. selectBLE();           // Route serial data to the BC118. //  REMOTE_ERROR - No remote devices exist. //  INVALID_PARAM - You've called the function with an invalid parameter. //                   manner; timely is redefined for each command. //  MODULE_ERROR - The BC118 didn't like the command string it received. //                  commands and parameters outside the built-ins. //  SUCCESS - What it says. // Reset is a blocking function which gives the BC118 a few seconds to reset. //  the "SCN OFF" command after the reset is completed. Why is this important? //  Because if the device is in central mode, it *will* be scanning on reset. //  strings from the BC118. //  to write/reset when changing anything. // One more reset, to make the changes take effect. // NB!!!!!!!!!!!!! This write/reset thing is *really* important. //  case and the module still needs to be reset before that is actually true. //  a blinking red LED on the BLE Mate. //  send us some data. //  and I can switch over to the PC to report what I've heard. // This is the peripheral example code. // When a remote module connects to us, we'll start to see a bunch of stuff. //  something. If no, discard it. //  String object after you find \n\r!!! inputBuffer.trim(); // Remove \n\r from end. inputBuffer.remove(0,4); // Remove RCV= from front. //  work like we want. //  whether you want it to or not. We'll disable that. //  to scan without our permission, so let's disable that. // Put the module in central mode. // Reset the module. Write-reset is important here!!!!!! // The module is now configured to connect to another external device. //  can easily check against the result while we're iterating. //  finds some. Why? Why not? //  starting at 10, we know when we've found something b/c it'll be 4 or less. //  we'll connect to, but only after we report our address list. //  if we're in central mode instead of peripheral mode. //  wrong than merely being in the wrong mode? //  want to tweak before we reset the device. // The CCON parameter will enable advertising immediately after a disconnect. // The ADVP parameter controls the advertising rate. Can be FAST or SLOW. //  0 (for never) to 4260 (71min); integer value, in seconds. // The ADDR parameter controls the devices we'll allow to connect to us. //  All zeroes is "anyone". // We're set up to allow anything to connect to us now. //  using the SmartBasic, you can leave this part off. Make liberal use of the write() and reset() functions when changing settings. Software serial is likely to be overwhelmed by the data from the BC118, so don't expect good results from it. Don't forget that Serial writes/prints are non-blocking. The library functions are all blocking with timeouts, but if you multiplex the serial port you'll need to add Serial.flush() after non-library uses of the serial port to avoid writing non-command strings to the BC118. The BC118 must be in scan mode to connect to a peripheral! Here's some more information to move you beyond this tutorial. BlueCreation Product Page - This is the product page for the BC118 module. Command Set Manual - This is for version 2.6, which should be on the modules we ship. iOS App in AppStore - Use this to update the firmware on the BC118. Note that updating the firmware may break the library, so use with care! Android App on Google Play - Use this to update the firmware on the BC118. Note that updating the firmware may break the library, so use with care!